Qatar Crisis and Iran: A “Win-Win” for the U.S. Establishment? JUNAID AHMED, junaidsahmad at gmail.com Ahmed is in Virginia for a brief period. He is assistant professor, faculty of advanced studies at the University of Lahore in Pakistan. He is also director of the Center for Global Dialogue. He said today: “The GCC strategy to isolate and strangulate Qatar is a ‘war of attrition’ against the one GCC member state that had a modicum of autonomy from an otherwise unified Gulf autocratic strategy to isolate and target both Iran and all the regional ‘problematic’ mass oppositional elements, including Hamas, Hezbullah, the Muslim Brotherhood, etc. 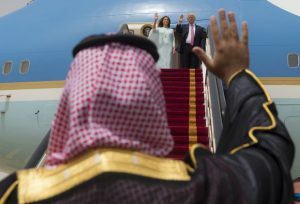 The paranoid, insecure, and schizophrenic Saudi ruling family has used this opportunity to get full Egyptian-Israeli backing for an effort they know is fully in sync with what President Trump recently conveyed to his friends in Riyadh: let’s all get together to target Iran.” Ahmed is also secretary-general of the International Movement for a Just World (JUST) based in Kuala Lumpur, Malaysia. He just wrote the piece “The Qatar crisis: A ‘win-win’ for the United States?” which states: “Notably, in the wake of the Arab spring, which witnessed the brief resurgence of the Muslim Brotherhood and other Islamist groups, both Saudi Arabia and the UAE had identified such forces as potential existential threats to their own regimes, not only because the Brotherhood enjoyed much support amongst their own conservative populations, but also because it offered the region an alternative Islamic governance model that dispensed with the need for hereditary monarchies. “Long on the lookout for a counterweight to Saudi dominance over the Arab world, wealthy but vulnerable Qatar had been bankrolling the Brotherhood in Egypt and — through its massively influential Al-Jazeera network — providing its leaders with consistently favorable international coverage. Understandably, the palaces in Riyadh and Abu Dhabi were alarmed. “Pundits have put forward a number of reasons as to why the escalation has happened right now. “Many, for example, have pointed to a strengthening relationship between Israel, Saudi Arabia, and the UAE, and their common goal of cutting off Qatari assistance to Hamas. Certainly, Qatar’s hosting of a Hamas conference last month did not go down well, and perhaps helps explain why — according to the leaked emails of the UAE’s ambassador to the U.S. — a recent high profile anti-Qatar symposium was staged by a major Washington-based, pro-Israel think tank. “While such objections may indeed have been contributing factors to the current crisis, the more likely catalyst has, however, been the role played by the new U.S. administration.